The best (and easiest!) chocolate cupcakes made from scratch topped with my favorite vanilla buttercream frosting recipe. 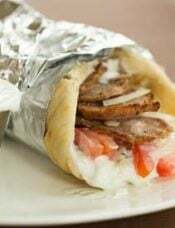 A perfect combination! Oh hello there cupcake perfection. 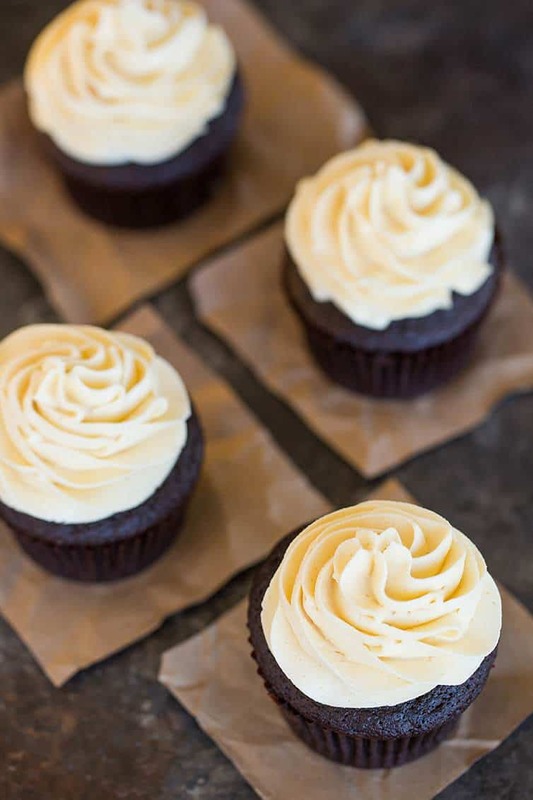 For all of the cupcake recipes that live on this site, can you believe I had yet to share with you the classic combination of chocolate cupcakes and vanilla frosting? 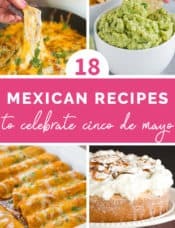 I’ve used each of these recipes in other places, fancied up in different ways, but the chocolate-vanilla combo definitely deserves its own place of prominence on these virtual pages. 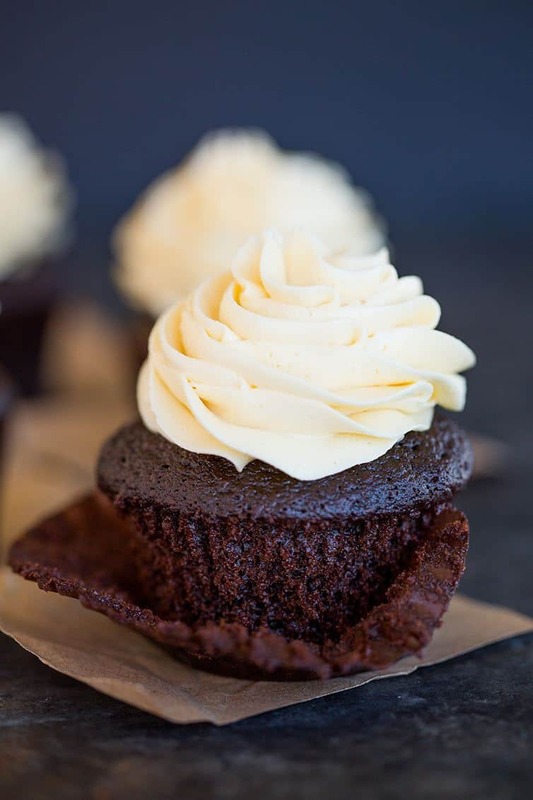 If an ultimate chocolate cupcake sounds like too much for you (yes, we can still be friends), and a vanilla/vanilla cupcake seems a bit too, well, VANILLA… this is the best of both worlds and the balance that you might be craving. Okay, let’s first talk about the chocolate cupcakes here. These are the only chocolate cupcakes that I’ve made for years and years. They are the base of the ultimate chocolate cupcakes, which also includes a chocolate ganache center and a satin-like chocolate frosting (they are sublime). They are perfect for big-time chocolate lovers, but I’ve also had tons of success adapting it for other cupcake adventures. I omit the ganache center and go from there… they were the perfect base for the Cookie Monster cupcakes I made for Joseph’s birthday last year! So, How Do you Make Chocolate Cupcakes From Scratch? It’s insanely easy, I promise! In fact, this might the easiest, BEST chocolate cupcake recipe I’ve ever made. 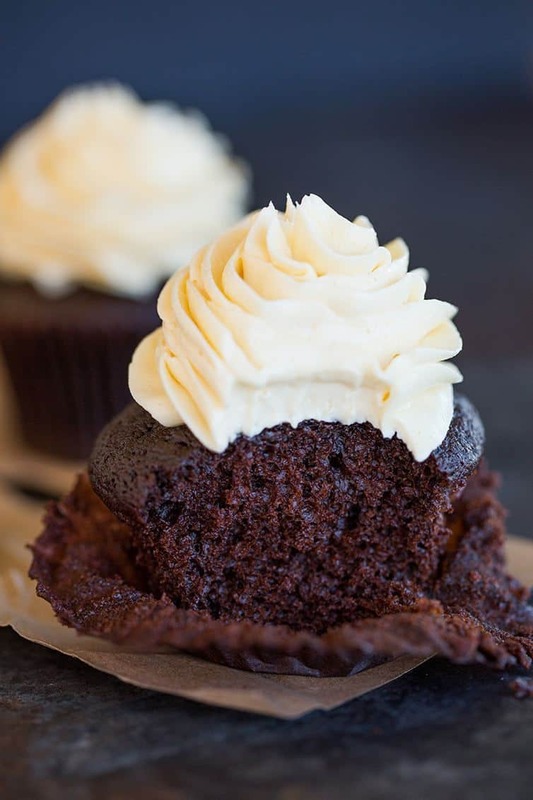 There is no butter in the recipe, so you don’t have to wait for it to soften, which means as soon as you have a craving for chocolate cupcakes, you can start ASAP. Additionally, no mixer required! I love my stand mixer as much as the next person, but I also love simplicity, and this recipe is the definition of simplicity. 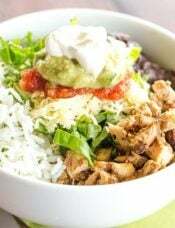 Just grab two bowls and a whisk and you’ll be good to go! These chocolate cupcakes are seriously the BEST. They are soft, super moist, and fluffy – exactly what you’d expect from the perfect cupcake recipe. I’ve yet to find a better chocolate cupcake recipe! QUICK NOTE! I get a lot of questions from people who don’t want to use coffee in chocolate recipes because they don’t like the taste of coffee and want to know if they can use a substitute. Here’s the thing, I get you, I don’t like coffee either, I don’t drink it. However, when it’s called for in a chocolate recipe, it’s to enhance to the flavor and really intensify it more than using water would. You cannot taste it in the actual recipe, I promise! If you can’t use coffee for a medical or religious reason, then you can totally substitute hot water. If you just don’t like coffee, I beg you to have faith and use it… you won’t taste it and your chocolate will have significantly more depth of flavor! 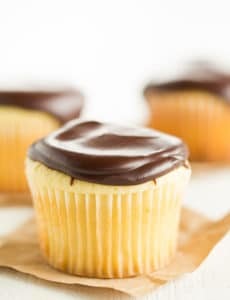 Now, let’s move on to the vanilla frosting on these beautiful chocolate cupcakes. It’s a super simple American buttercream frosting (i.e. butter with powdered sugar and vanilla), and is a serious DREAM. So, How Do You Make Buttercream Frosting? I first came across this vanilla buttercream frosting recipe nearly 10 years ago while I was watching a local morning show. They were featuring a local bakery, which happened to share their cupcake frosting recipe during a recipe demo on air. It’s super simple, but the trick is to cream the butter at medium-high speed for a full five minutes before adding any sugar. The difference that makes is mind-blowing. Many buttercream recipes taste sickeningly sweet or gritty from the powdered sugar. 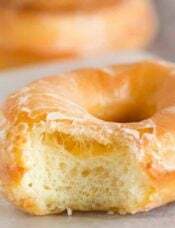 By using more butter and really whipping it up, it creates a frosting that is light-as-air, silky, and melts in your mouth. The original recipe didn’t include heavy cream, but I find if I’m using it to pipe cupcakes, the cream helps to thin it out just enough to make it easier to pipe and spread, and not so thick. Also! 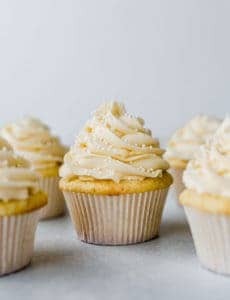 If I’m making this vanilla frosting for cupcakes and am not planning on adding any sprinkles or drizzles, I’ll often substitute vanilla bean paste instead of the vanilla extract so you can see all those gorgeous flecks of vanilla bean in the frosting! There you have it! 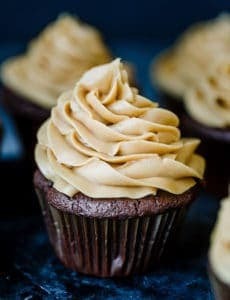 The absolute best combination of my favorite chocolate cupcakes and the best vanilla frosting recipe. 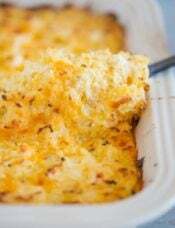 So simple, but so delicious and a total classic! I hope you’ll make these cupcakes and share them with some of your favorite people… whether it’s for a birthday, a special occasion, or just an after-school snack. They are deserving of being served for any reason you can dream up! The absolute best (and EASY!) 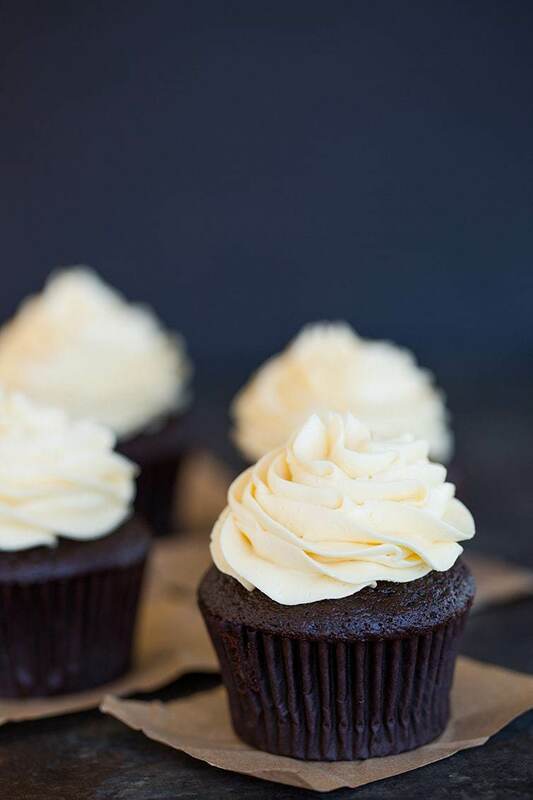 chocolate cupcakes topped with silky smooth vanilla frosting. Make the Cupcakes: Preheat oven to 350 degrees F. Line a standard-size muffin pan with liners. Place the chopped chocolate and cocoa powder in a medium bowl. Pour the hot coffee over the mixture and whisk until smooth. Refrigerate mixture for 20 minutes. Meanwhile, whisk together the flour, sugar, salt and baking soda in a medium bowl; set aside. Whisk the oil, eggs, vinegar and vanilla extract into the cooled chocolate mixture until smooth. Add the flour mixture and whisk until smooth. Divide the batter evenly between the muffin pan cups. Bake until the cupcakes are set and just firm to the touch, 17 to 19 minutes. Cool the cupcakes in the pan on a wire rack for 10 minutes, then remove the cupcakes from the pan and place on the wire rack to cool completely, about 1 hour. Make the Frosting: Using the wire whisk attachment of your stand mixer, whip the butter on medium-high speed for 5 minutes, stopping to scrape the bowl once or twice. Reduce the speed to low and gradually add the powdered sugar. Once all of the powdered sugar is incorporated, increase the speed to medium-high and add the vanilla, mixing until incorporated. Whip at medium-high speed until light and fluffy, about 2 minutes, scraping the bowl as needed. Add the heavy cream a little at a time, whipping after added, until desired consistency is reached. Frost the cupcakes as desired (I used the Wilton 1M decorating tip). Frosted cupcakes can be stored in an airtight container at room temperature for up to 3 days. 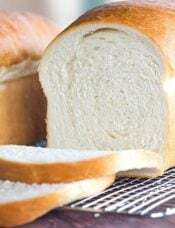 You can substitute all-purpose flour for the bread flour if needed, but bread flour is recommended. I used Ghiradelli 60% cacao bittersweet baking bar for the bittersweet chocolate. Hello. Thank you for the recipe. Why is bread flour used in your cupcake recipe? Thank you. Hi Madeleine, The bread flour helps the cupcakes maintain their structure with the ganache filling. Michelle, have you ever made these as mini cupcakes? If so, how long would you recommend baking them for? I’ve made them as standard size, and they are the best ever! Hi Isa, I have not personally but I know many have! I would start checking around 8 minutes just to be on the safe side.